Before Chinese New year officially ends at the end of the week I thought I’d squeeze in another suitably festive recipe. 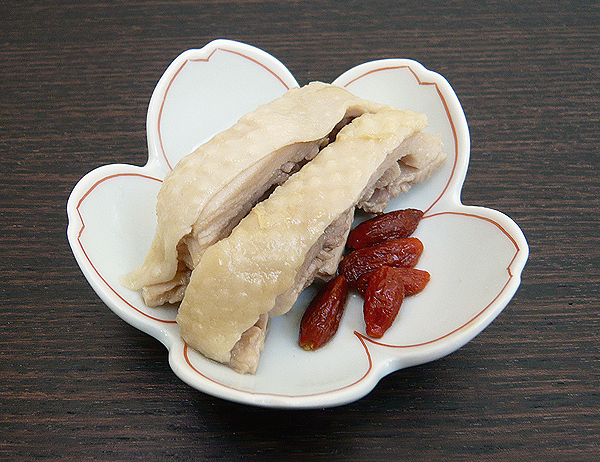 Drunken chicken is a Shanghainese dish that is often found on the cold platter served at the start of a banquet. I prefer the drunken flavour (achieved by steeping cooked chicken in a shaoxing wine marinade) to be subtle with just a hint of alcohol, so I leave the chicken in the soaking liquid for a only couple of hours. If you prefer the more traditional heavily-spiked version, then double, or even triple, the amount of shaoxing wine you use (the best thing to do would be to taste the marinade after mixing and adjust the amount of wine according to your taste) and leave to marinate overnight. Serve as a starter, on its own or with a selection of cold and hot appetizers. Bring water to the boil then add in the spring onions, ginger and salt. Lower in the chicken boil (on a medium flame) for 8 minutes. Turn the heat off, cover pot with a lid, and leave for 15 minutes. Remove the chicken and drain (reserving the cooking liquor for use in the marinade). When the chicken is cool to touch, debone and cut into neat slices. Place in a deep dish and set aside. In a bowl mix all the marinade ingredients, then pour over the chicken (the chicken pieces should be totally submerged in the liquid). Leave to steep for 2 hours, then taste. If it isn’t as “drunken” as you would like then leave to marinade further, overnight (you may also wish to add more salt at this point if the chicken tastes a little bland). Once the chicken is ready remove from the marinade and refrigerate for at least a day before serving (it can keep chilled for up to 5 days). You can reserve the berries (put keep them separate from the chicken as they will stain the meat) and marinade (which will have taken the form of jelly) to serve alongside the chicken. ~ by gourmettraveller on February 22, 2010. I haven’t had this in years. Good stuff!